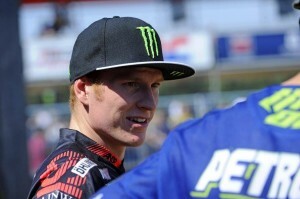 Max Anstie scoring fifth place overall at Glen Helen today for the Monster Energy MXGP of USA. The Brit rode to fourth and eighth positions in two sweltering motos around the long Californian venue and through insufferable temperatures that hit the mid-thirties. MXGP headed to the west coast of the USA after the penultimate round in Mexico last week and for the first time since 2011. A 22,000 crowd spread about the small but steep hills with the renowned layout mixing many elevation changes and attackable jumps. Anstie faced some adversity on Saturday when a rock pierced his water pump and caused a DNF. It meant he entered the gate almost in last position for the long drag towards the unique banked first turn. Anstie made a horrendous start in the first moto and was among the last of the riders as the pack went up the hill for the first time. From that point Max was able to settle into a scorching rhythm and sequence of laps that dragged him through the field. With three circulations to go he had passed Tim Gajser and was hunting Valentin Guillod. The pair engaged in a dogfight to the finish for fourth place and Max won the dice by nine hundredths of a second. The points confirmed third spot in the world and scrubbed away some of the pressure for the second moto. The last dash of the season started positively with a blast away from twenty-third in the gate to third position around the opening turn but then Max crashed in the next corner. Remounting he again found lines and places to pass and recovered all the way to eighth. A best Grand Prix season for Anstie as well as the team this century has come to an end but the coming weeks still see the squad with work to do. Swiftly packing up the crates in the Glen Helen paddock, Monster Energy DRT Kawasaki then embarked on flights back to Europe and in preparation for Anstie’s second representation of his country at the Motocross of Nations. A week further on and the sand of Fatcat in Doncaster should see the 22 year old wrapping up his first British title.